initial strength of the cards they’ve been dealt and decide if it’s an opportunity worth pursuing. Similarly, salespeople must assess the initial sales lead and respond successfully to the ever-changing dynamics inherent in the process of all sales. Awareness - Is the preparedness, but it is much more. It is how to employ those techniques and turn them into winning strategies. 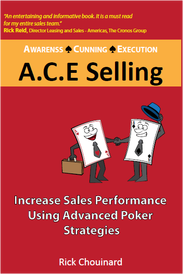 Awareness is the backbone of ACE SELLING. It is the foundation upon which all else rests. Cunning - Is what is required as the process unfolds. It’s the outwitting and out maneuvering of your opponents, using skills that puts you firmly in a winning position. Execution - Is the endgame. It is what separates the good players from the best players. Without proper execution you will be like the team that gets to the Super Bowl every year but can win the big one.